The Sea Eagle, or White-tailed Eagle is the biggest bird of prey in Northern Europe. It can be seen on most parts of the Norwegian coast, but it's in Northern Norway that you're most likely to see it. The biggest population of Sea Eagle is actually found near Bodø. By 1968 the Sea Eagle was almost extinct in Norway, but after being protected by the Government, the population has grown. Hurtigruten offers lots of different excursions. The Sea Eagle can often be seen from the Hurtigruten ships themselves, but many guests choose to participate in a Sea Eagle Safari, arranged by one of the many small tourism businesses which are found along the Norwegian coast. Actually many of these small businesses rely heavily on the Hurtigruten to bring customers their way. To watch the Sea Eagle swoop down to the sea surface, and pick up a fish with it's claws is a great experience! Truly a majestic bird. Want to read more about Hurtigruten's excursions? The Sea Eagle Safari is one of the excursions I mentioned in my earlier post Excursions with Hurtigruten - highligts. MS Finnmarken - soon in Hurtigruten colors! Fans of Hurtigruten are waiting for the MS Finnmarken to return to the Norwegian coast from Australia. She has been painted in all white for a couple of years now, and before returning to Norway she needs to get back in the Hurtigruten colors of white, red, and black. 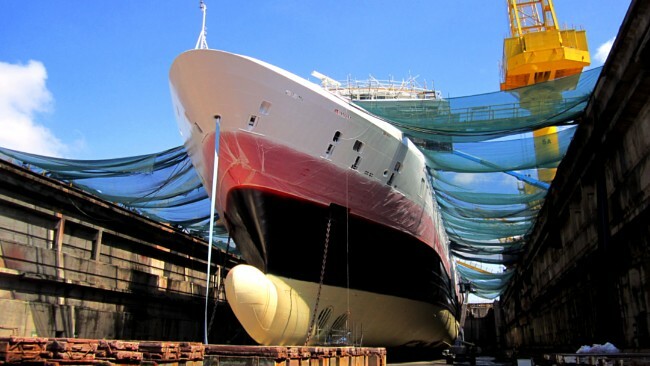 On the way back from Australia, the MS Finnmarken is visiting a ship yard in Singapore, for new paint and modifications back to Hurtigruten's standards. Norwegian NRK is reporting that the weathered and rusty hull seen in a few photos, was due to restriction on outside maintenance. But now the MS Finnmarken is getting a good overhaul. The voyage from Singapore to Norway is estimated to take 43 days, and will be via Cape Town. No doubt, this is to avoid the pirate activities near the Suez canal. "Finnmarken" is an old way of spelling the name of the northernmost county in Norway, Finnmark. The name Finnmarken is a name with long traditions with Hurtigruten. Three Hurtigruten ships have had the name, the last one before today's MS Finnmarken, can be seen standing on dry land at the Hurtigruten museum in Stokmarknes (you can check out the pictures from when the old ship was put onto land). If you're going on a cruise with Hurtigruten, my guess is that you already know that it will not be like a cruise in the Caribbean. Although the weather in Norway can be really nice and warn in the summer, a big part of the country is north of the arctic circle. Did you know, the MS Finnmarken actually has a pool? A couple of the other ships have jacuzzis on deck and it can be quite the experience to sit in the hot water in the winter, looking up at the stars and Northern lights. You might want to wear a warm hat or something, on your head though! Read more about Northern lights! Related post: The MS Finnmarken has started its voyage home! As you might have read in one of my previous posts, the veteran ship MS Nordstjernen is leaving the Hurtigruten fleet next year. But, what you didn't know is that according to NRK the ship has a ghost on board travelling with the ship, its crew and passengers. In september 2011 a team of "ghostbusters" from Norwegian Ghost Hunters showed their interest in the ship because of the story of "Ernst". This is supposedly a ghost of a german worker, who got killed in an accident aboard the MS Nordstjernen when she was built i Hamburg in 1955. According to captain Ole Johan Andreassen, who says he has felt the presence of "Ernst", this is a friendly ghost. The team from Norwegian Ghost Hunters wants to bring their technical equipment to check out some of the mysterious things that people have experienced aboard the MS Nordstjernen. Should the team find evidence of this ghost, captain Andreassen still wants to leave "Ernst" alone: "He has sailed with this ship for so long, so he will be with us until the MS Nordstjernen is retired" he says. Are you a sceptic? It's a great story anyway! Hurtigruten is inviting you to celebrate Christmas with them, aboard one of the ships sailing the Norwegian coast. Unlike the rest of the year, the ships will dock for 24 hours on Christmas eve, so that passengers can stroll the Christmas decorated streets of Norwegian towns and communities. Or maybe attend a Christmas service at a Norwegian church. Enjoy a Christmas cruise in comfort with Hurtigruten. In the days before Christmas, Hurtigruten's guests are participating in traditional Christmas activities, like making decorations, singing Christmas carols and making gingerbread. On Christmas eve itself, all guests gather for a Christmas dinner and unwrapping of Christmas gifts. Hurtigruten also offers a Christmas voyage in Antarctica.